← Hyperstar III and mini-WASP array images from the same night. 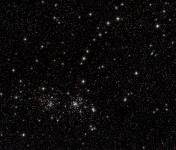 If you look at the Double Cluster with a pair of binoculars or a low power telescope, there is something that immediately strikes you. 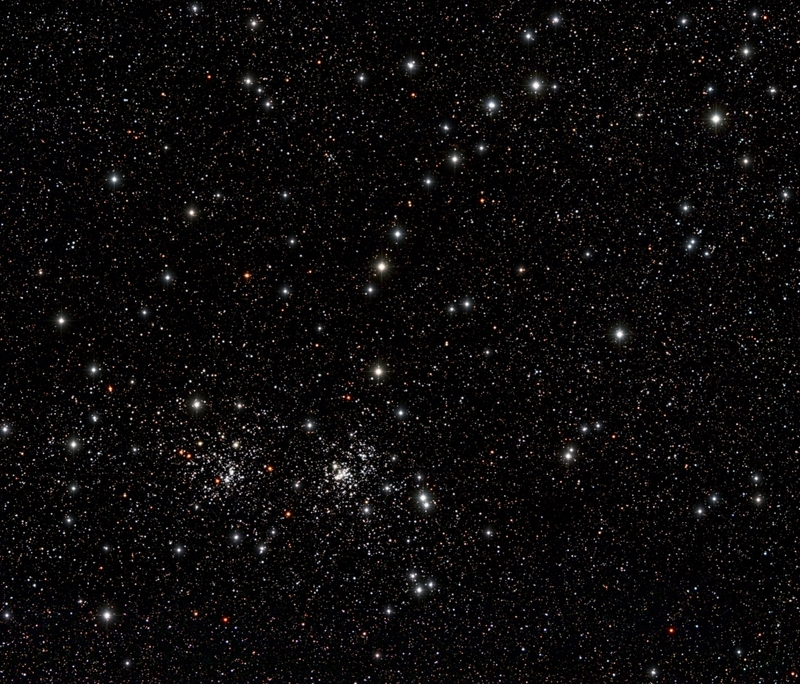 There is a group of very bright stars forming a large ring that emanates from the Double Cluster, off towards the top right. This ring of stars looks like a bracelet with the Double Cluster attached as some sort of celestial charm. Now what’s really odd about the bracelet itself is that it is not clearly visible on planetarium programs, nor is it clear on most images of the region – but the human eye and a pair of binoculars really show it very clearly indeed – must be some property of the eye involving contrast enhancement (and survival 🙂 ). Well, this is the first image that I’ve taken of the region that actually shows Greg’s Charm Bracelet pretty clearly. This image comprises two datasets put together by Noel Carboni with a final bit of tweaking from yours truly to bring out the bracelet more clearly. Data was acquired in two imaging sessions using the mini-WASP array and is around 4-hours of total integration time using 4-minute sub-exposures. Just saw your image on EPOD, and had to grin and say thank you! I’ve been admiring that asterism through binoculars (of various sizes) for years, and always thought that someone must have noticed it and named it. Glad you did, and I’m happy with the name you gave it. Pretty handsome site you’ve put together, by the way! If you ever get a chance to attend the Oregon Star Party (www.oregonstarparty.org), please do, and let me know: I’m one of the merry band that makes that event happen.